The Stated Truth » Rich Man, Poor Man….How Do We Fix It? Back on October 27 we did a report on the worlds wealth pyramid titled A Travesty Of Grandiose Proportions (click the blue lettering to review). The report discusssed the great disconnect in the world today between the wealth of the super rich and everyone else. Now, in todays review, we are going to touch on income extremes, with hopes it can somehow be fixed before the whole system falls apart. Something is clearly wrong when 47% of workers earn a poverty level income. Similarly, there is something wrong when 1% of workers earn 14% of all income. Actually though, we agree with Bruce Krasting that in the end, things probably can’t be fixed (until there are riots in the streets). Let’s start at the top of the pile, those that are making the really big bucks. 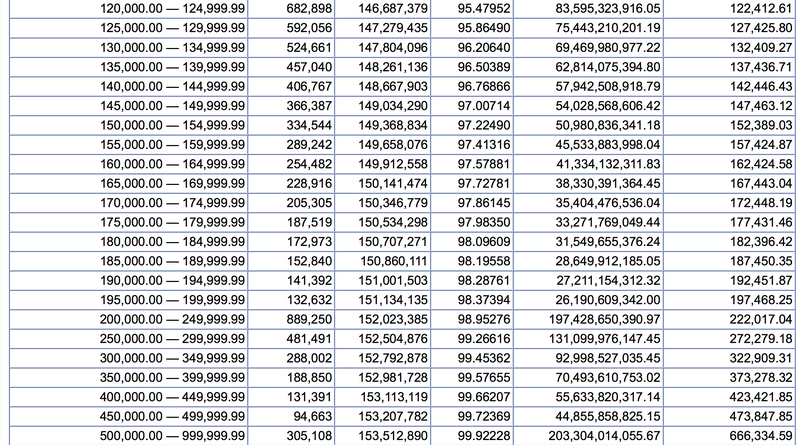 For example, consider the number of people who made $50m in 2012 (the 0.0001%). There are 166 people in this group. Who are these folks? Basketballer Lebron James made the list, so did actors/performers Robert Downey Junior, Beyonce, Cameron Diaz and Christian Bale. From the corporate side we have Disney’s Robert Iger and Apple’s Tim Cooke. Who are the wealthy in America? Anyone making over a million bucks a year is certainly on the list. The plus $1M set totaled 119,400 people (0.08%). These lucky few earned a total of $170b (3% of all income). How much should these folks be paying in taxes? Let’s go hog wild and nail them with a tax of 90%. The incremental revenue (they already are taxed at 39.6%) would be $85b, but sadly, that only covers five weeks of Social Security benefits. The top 1.6m workers (1% of total) earned $900b (14% of all income). This is the measure of US income inequality. The 1% earn 14% of the pie. If the federal tax rate were increased to 75% (double current), it would increase revenue for Uncle Sam by about $150B. That does not fill a $1 trillion bucket, and it would be an economic disaster to set tax levels at Tax REFrench rates. Bottom line – the notion that taxing the rich is a solution is all wet. So who is left in the middle? 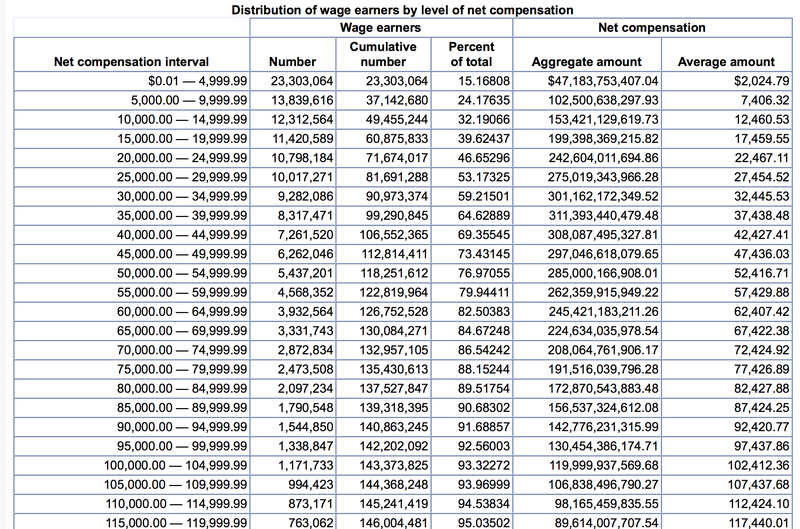 There were 41m workers (23% of total) who made more than $50k and less than $250k. This group earned $3.5T (52% of total income). So the middle is where the money is; a quarter of all workers earn half of all income. If Washington needs more revenue, it must come from the folks in the middle. But the reality is that the middle is already taxed from every direction (they also pay state income taxes, Social Security and other payroll taxes, property and sales taxes. So once again, raising taxes as a way of balancing the nation’s ledger seems to be a very difficlt task. What to make of all these numbers? Something is clearly wrong when 47% of workers earn a poverty level income. Similarly, there is something wrong when 1% of workers earn 14% of all income. The obvious solution is to tax those on the top and transfer it down to the bottom. But that is what we are already doing; more of the same is not going to change the outcome. Now consider the bottom. In the case of Medicaid, the cut off for availability is equal to 138% of the Federal Poverty Level (FPL). For a single person the number is $16,600, for a couple it’s $22,000, for a family of four it’s $33,000. The average income for all individuals/families that might qualify for Medicaid is about $25,000. If you look that up on the Social Security chart you see that a whopping 46% of all income earners can qualify for Medicaid.